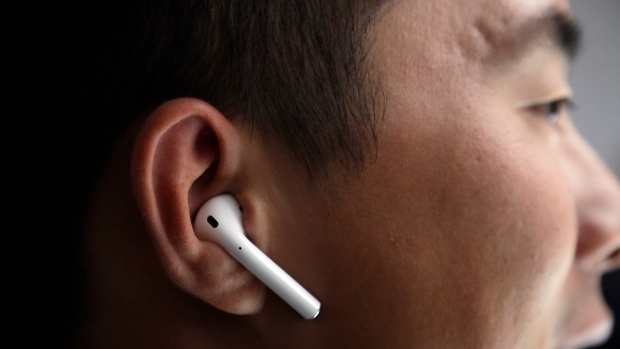 Apple Inc. (AAPL.O) on Wednesday announced its much anticipated second-generation AirPods, adding hands-free Siri access, 50 per cent longer talk time and optional wireless charging. AirPods have been a hit with consumers since their 2016 debut, and anticipation has built for a followup product. The new version, which will still cost US$159 and be available in stores next week, look the same as the prior model. They add a new H1 processor that Apple says increases talk time and the ability to summon Siri by saying, “Hey Siri.” Users previously needed to tap on the headphones to activate the voice assistant. Apple also will sell a version that comes with a US$199 wireless charging case. Bloomberg reported on the new AirPods last year. The company is also working on a version that will be water resistant and feature noise-canceling functionality, Bloomberg also reported. Apple announced new iPads and iMacs earlier this week.